I love pizza. Most people do. Luckily vegan pizza has come a long way in the last few years. My girlfriend wanted some vegan pizza the other night after a hard day at work. Comfort food? Yeah. So, I looked online and found a pizzeria a few miles away that serves vegan pizza. 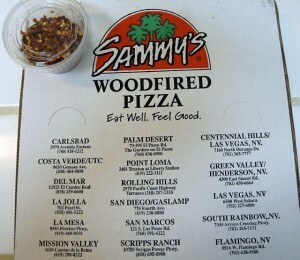 It’s called Sammy’s Woodfired Pizza in Carlsbad, close to San Diego, CA. They have several locations in San Diego, Southern California, and Las Vegas. See below for important caveats for vegans. Want a free pizza? Keep reading. I called and asked all the right questions (so I thought – more later) and ordered their vegetarian pizza to go, substituting Daiya vegan cheese for the regular cheese for a $2.00 upcharge and xing the fontina cheese. 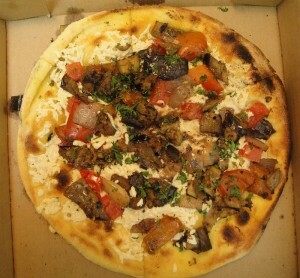 It had grilled eggplant, onions, zucchini, bell peppers, and tomatoes, with a roasted garlic sauce. They couldn’t tell me on the phone which brand of vegan cheese they use. So, we went to pick it up and I spoke with the chef and told him I wanted to be sure it did not contain casein. He was kind enough to check and informed me that they use Daiya cheese. Yay! He said he hadn’t tried it yet and I chuckled and told him it is really quite good. Anyway, thanks for checkin’ chef. Hey, they have gluten-free pizza, too. The atmosphere at the restaurant was quite nice with a warm ambiance and very busy. They have a little patio with a fire pit and the woodfired pizza ovens are on full display. We agreed we would have to go back for the full experience. We got two vegan pizzas because they are kind of small and there is only one size. We got home and opened the box and a beautiful vegan pizza stared at us and smiled. We chowed down. Their vegan pizza is excellent. Especially, the grilled veggies. The eggplant had a wonderful texture, much like mushrooms, and the flavor of the roasted garlic sauce with the Daiya cheese was a nice combination. Everything was very well-balanced and tasted oh soo good. Nom nom nom nom. The crust was pretty good. The crust. Ok. So, after we ate both pizzas I emailed Sammy’s Woodfired Pizza to just triple check all my facts before I posted this up on the interweb. I am new to this whole vegan thing, so I was remiss in asking about HONEY! Bah. Turns out I needed to ask a lot of questions.Lesson learned. See below for important caveats for vegan pizza at Sammy’s Woodfired Pizza. It would be nice if they DID advertise a vegan pizza on the menu, so that it would be clear to their employees and customers exactly what to order that could be considered vegan. Hey, but now YOU know. Also, their website is not up to date with all of their locations. There are a few not listed on there. You might try Google Maps instead. FREE PIZZA? Join their Insider E-Club on their website and get a coupon for a free pizza with the purchase of a menu item of equal or greater value. You can also follow them on Facebook or Twitter for deals. I called and spoke with their corporate chef, Jeff, and got more information. He said they are working on a vegan menu. Hooray! Go Sammy’s. Go chef Jeff. Here’s what you need to know in the meantime. Their regular crust contains honey. Order whole wheat, artisan, or gluten-free crust instead. Their “homemade sauce” is not vegan and contains cheese. You need to specify that you want marinara sauce without cheese. The roasted garlic sauce IS NOT vegan, but was at the time of this writing. They added Parmesan cheese. The Spicy Thai Peanut Sauce IS vegan. The veggies are grilled first thing in the morning on a clean grill, but it is the same grill used to grill meat, in case this is an issue for someone. The verdict. 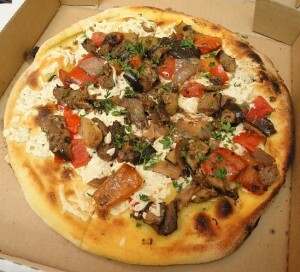 Awesome good vegan pizza. My girlfriend already went back. 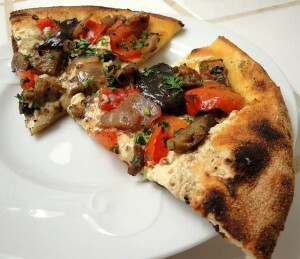 We will continue trying vegan pizza here in San Diego and I hope to make my own very soon. To avoid any controversy, the pictures here of vegan pizza are not vegan since I didn’t know the regular crust contained honey. We recently tried Tofurky vegan pizza with Daiya cheese. 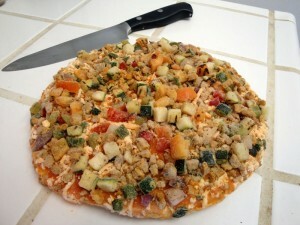 This is the review and it was funkin’ vegan pizza yummy. Highly recommended. 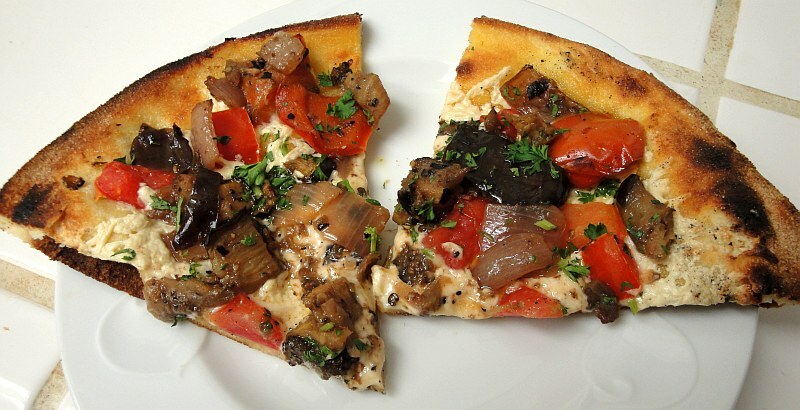 So, as a vegan, one of the things I miss the most is pizza. Yet, I don’t miss the side effects of eating animal products or all of the other bad stuff. 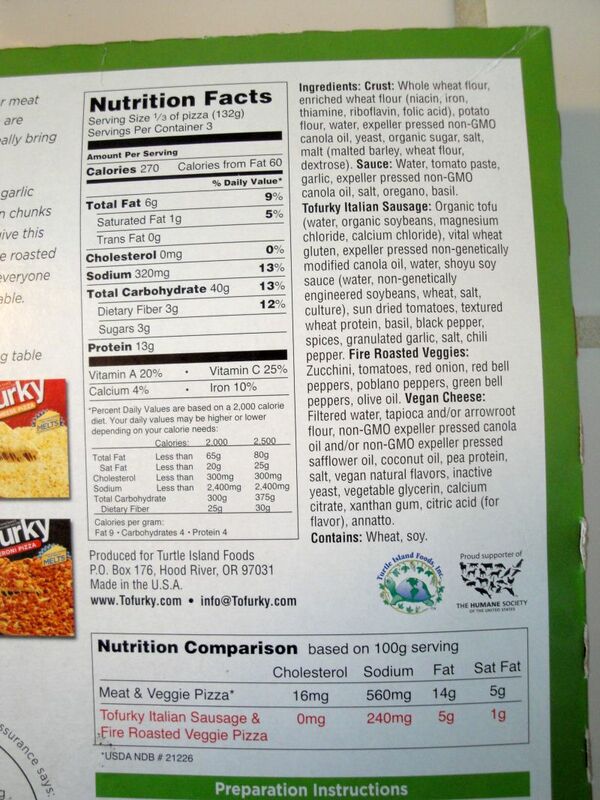 Now, if you look up the nutrition data on pizza, the facts are appalling. 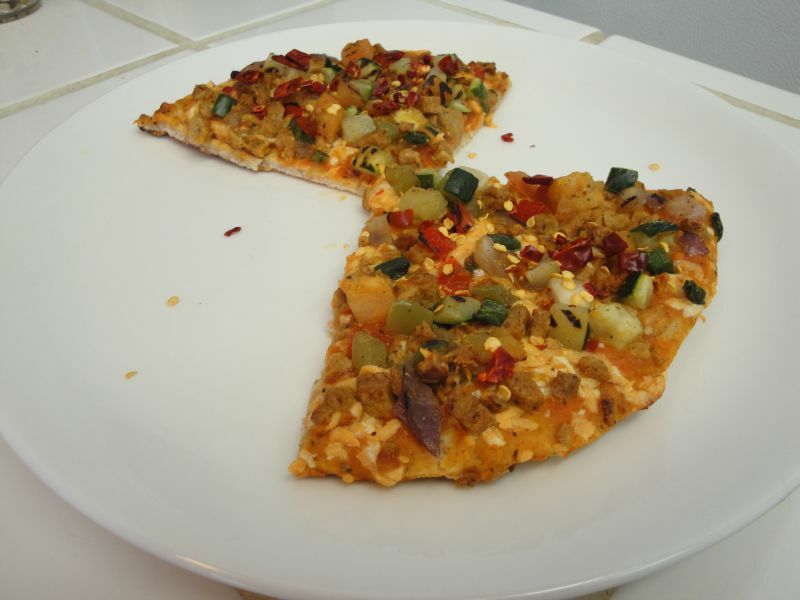 Regular pizza may taste good, but it is not necessarily good for you. 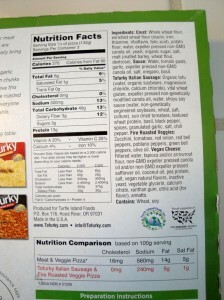 It’s loaded with fat, sodium, and calories. Sure, you get some protein from cheese and vitamin C from the tomato sauce. However, the negatives outweigh the positives. 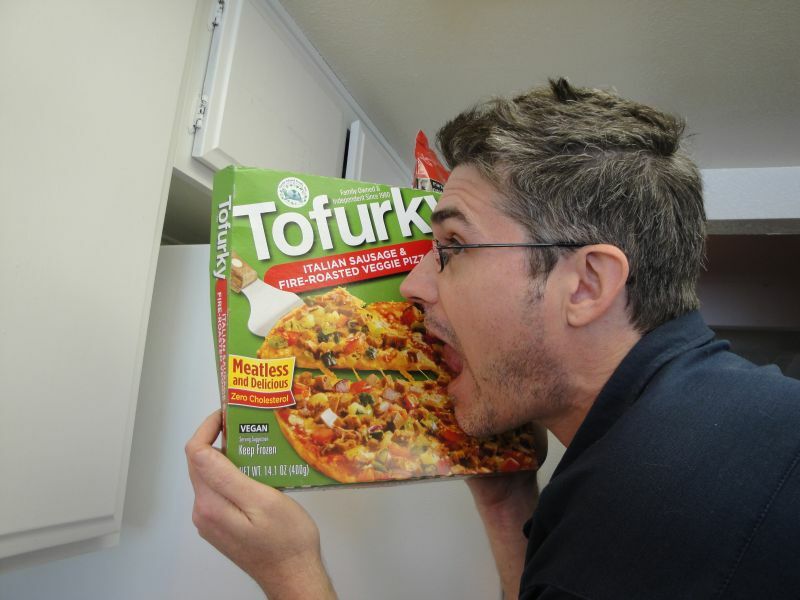 Tofurky has long been a leader in vegan food products. They started out making holiday plant-based vegan turkey meals for people who needed an alternative to the traditional Thanksgiving or Christmas dinner, and have branched out from there. Recently, they came out with 3 vegan frozen pizza varieties: Pepperoni, Cheese, and Italian Sausage & Fire Roasted Veggie Pizza and we opted for the latter, but have tried the others. We found them at our local Ralph’s grocery store (Kroger depending on your area) for $8.79 each. At 14.1 ounces each, they realistically serve 2 people (package says 3). I’ve adjusted the info for two total servings here, with approximately 405 calories per serving, 9 grams of fat, 480 milligrams of sodium, and 19.5 grams of protein. 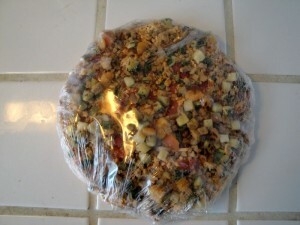 This is considerably less than chain pizza or regular frozen pizza, and the best part is it’s all vegan. No animals were harmed to bring you these most delicious vegan pizzas! 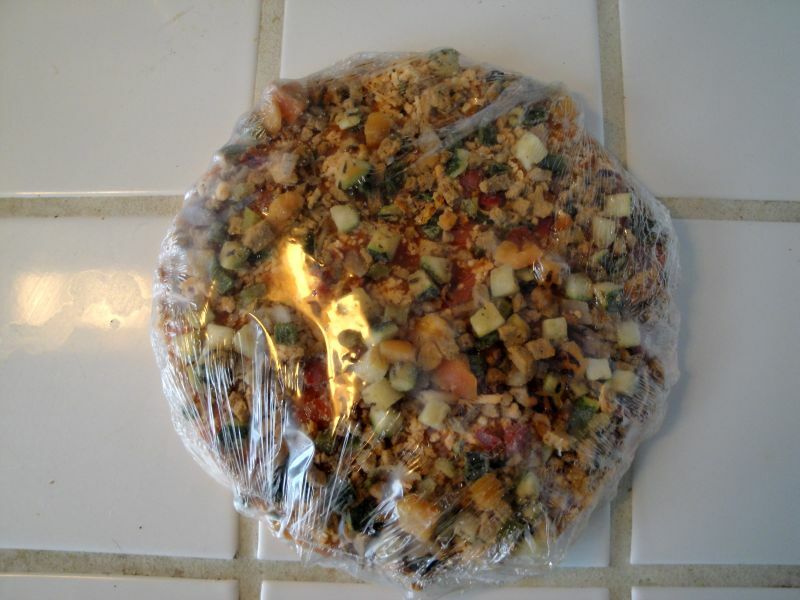 Quick and convenient, it took just minutes to make the pizza. We placed it in the oven and followed the package directions. 12 minutes later, just like a normal frozen pizza, it came out hot and cheesy, and ready to satisfy that vegan pizza craving. They use Daiya vegan cheese, which melts nicely and is likely one of the best brands of vegan cheese. The crust is amazing; light and crispy, with a good balance of the delicious tomato sauce and other ingredients, which is one of the keys to a really good pizza. Tofurky grills or fire-roasts the veggies which adds extra flavor, and combined with their great vegan sausage, that makes this is a winner. 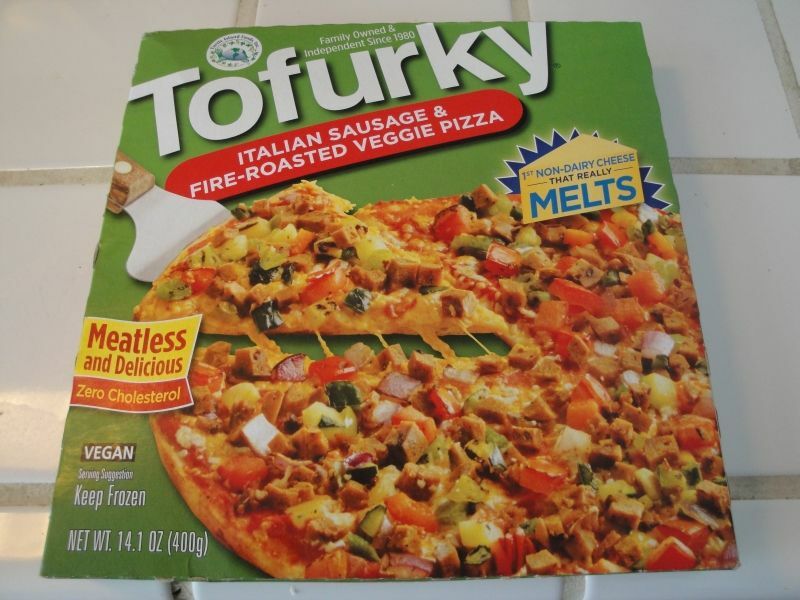 Tofurky Vegan Pizza is a great product for vegetarians or vegans on the go and those who don’t want to take the time to cook a vegan pizza from scratch. Fast food? Yeah. Fast and best of all no animals suffered for our indulgence. We like it, but still encourage you to experiment with making your own. 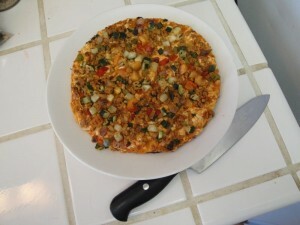 I’ll have to post a fresh vegan pizza recipe soon. Funny thing is that, as a vegan, I have slipped up on pizza before and have noticed it is a weak point for those trying to become vegan. So, it’s good to know this comfort food is easily available at our local grocer. I hope you find it and try it. If you cannot find them at your local grocer, try Whole Foods, or ask your grocer to carry them. They can also be ordered here or various other places online. Enjoy. Ready to slice and eat! © 2015 Proudly powered by a Vegan Diet, Funk Music, and Love!